Pillbugs have oval, gray bodies and measure no more than 1/2 inch long. Their armadillo-like segmented bodies have seven pairs of legs. 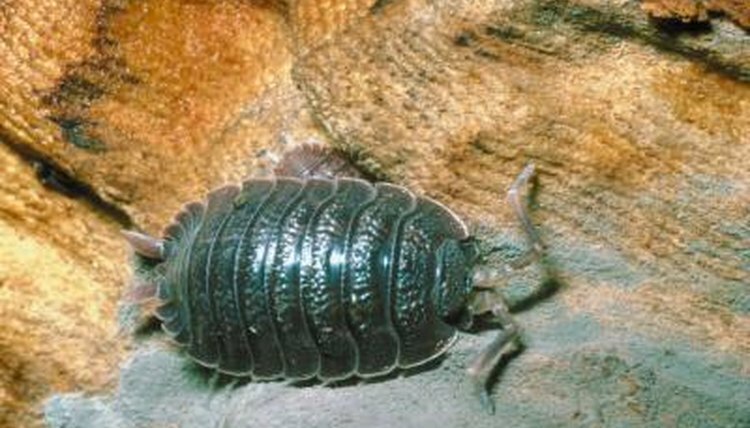 Although pillbugs resemble insects, they are actually isopods, which are a type of crustacean. Pillbugs require moist and humid climates to survive. Northern State University suggests that pillbugs were first introduced to the United States from Europe in the early 1800s. Lumber trades and railroad freight in the Midwest likely helped spread the critters out to other states. Today, pillbugs are commonly found in habitats, such as mountains, deserts, grasslands, forests and marshes in most parts of the U.S..
Pillbugs prefer dark, damp and humid micro-climates. Large populations of pillbugs hide underneath mulch, leaf litter, rotting logs, stones and peeled bark. In a city setting, pillbugs inhabit spaces near a home's foundation or basement, as well as along sidewalks and in places like flower pots. Different species live in different habitats. Porcellio spinicornis, a species of woodlouse, are commonly found in city habitats, while Trachelipus rathkei, a member of the pillbug, prefer hiding under tree bark and wood piles. Although they sometimes find their way into homes, pillbugs won't survive long without moisture. Pillbugs are nocturnal critters. When temperatures are high and the sun is shining bright, they are tucked away in damp, shaded shelters. Since pillbugs are isopods, they breathe using gills. They depend on highly humid climates to keep their gills moist, which prevents their respiratory system from drying up and rendering it defective. High humidity and moisture are also necessary to prevent dehydration. In addition to nocturnal behaviors, water loss is prevented by burrowing just beneath the soil, curling up into little balls and aggregating together in groups, which reduces evaporation. At night, when temperatures are cooler, pillbugs leave their dark and damp hiding places to forage for food. They search for food such as decomposed grass clippings, moss, fungi and young garden plants. Although pillbugs are mainly herbivores, they sometimes scavenge for decaying animal materials if no plant matter is available.